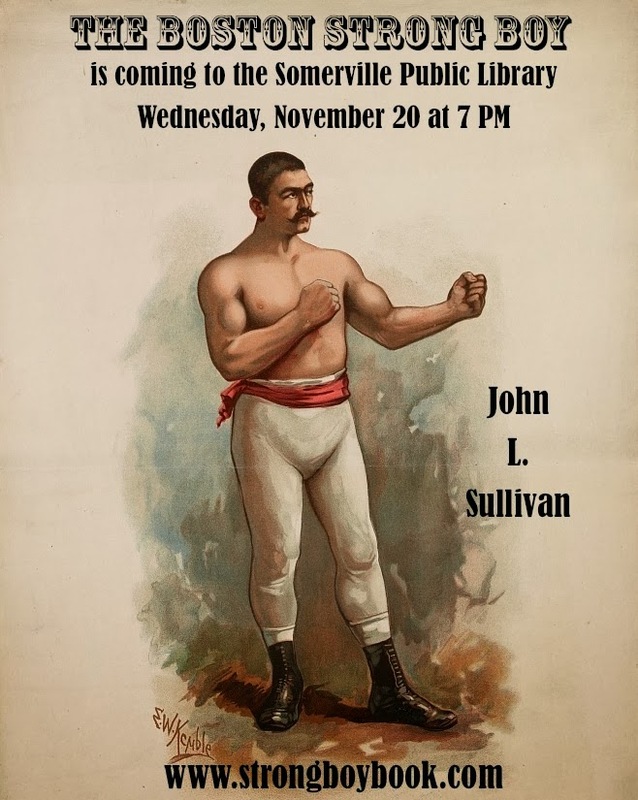 Tomorrow meet and hear Christopher Klein, author of Strong Boy: The Life and Times of John L. Sullivan, America's First Sports Hero. Wednesday Nov 20th, 7pm at Somerville Central Library, 79 Highland Avenue. Copies will be available for purchase. Sullivan seems to be a slightly forgotten folklore hero, though the populist image of the mustachioed strong man no doubt pays homage to him. As part of this author event ArtOfManliness.com have created some gift packs to give away on the night - thx guys. We will continue the discussion afterwards at Five Horses in Davis Square and perhaps keep going until the 10:30pm network premier of Alternate Route featuring The William Brown Project's Matt Hranek. In the hopes of confusing any pursuing lawmen about which jurisdiction they would sully, the fight contingent’s tug straddled the watery state line between New York and New Jersey. Finally, ten miles upriver, they halted near the New York suburb of Yonkers, and an anchor struck the murky midstream bed of the Hudson. In the dimly lit reaches of the ring, a hulking figure with blankets draped over his broad shoulders sat huddled on a campstool. John L. Sullivan shivered lightly as he listened to the Hudson lap against the barge and felt the river roll softly beneath his feet. He breathed in the cool west breezes, fragrant with grass and trees that dissipated the fumes of whiskey and cigars hovering over the barge. The twenty-three-year-old boxing phenom from Boston had been the chatter of the heavyweight class. Reportedly blessed with the perfect combination of speed, strength, and stamina, the slugger had dominated every opponent he had faced. New York fight fans risked arrest and paid the steep ticket price of ten dollars to see him—and hopefully watch him get pounded by the city’s biggest brute, John Flood. Outside of his manager, Billy Madden, and his second, Joe Goss, John L. had few friends in the heart of Gotham. The locals gave the scattered Sullivan backers on board 3–1 odds. When the “Boston Strong Boy” shed his blankets and stood stripped to his waist, however, Flood’s backers had second thoughts. Muscular without being muscle-bound, Sullivan was constructed like a pugilistic product of the Industrial Age, a “wonderful engine of destruction” manifest in flesh and blood. The faint torchlight tickled his chiseled biceps and rippled back. It gleamed off his thick chest from which his deep bass voice rumbled. It lit up his enormous shoulder blades, which provided the necessary foundation to support his bull-like neck and bullet-shaped head. His clean-shaven chin glistened like polished granite, although darkness hid in the recesses of a deep dimple. Sullivan’s pristine skin, full set of even teeth, and straight nose belied his profession and visibly testified to the inability of foes to lay a licking on him..."
10E2272: Steam Horse Dry Goods Co.